Keeping students motivated and interested can often be challenging; even more so when you’re dealing with distance learning. There are of course several pedagogical approaches that we can use to keep students motivated, but lately I’ve been thinking about how we could make the tools that we already use in education more student friendly, more engaging and fun to use. And here’s an idea I’ve been playing with in my mind lately: the integration of smart progress bars into a LMS (Learning Management System) to increase student engagement. I’ve noticed that several websites are using progress bars to encourage users to fill out their profiles. You’ve probably seen this on LinkedIn or SlideShare and even in various tutorials. Another thing I’ve noticed is that these progress bars really work on me! Every time I see one of these I try to increase the level of completeness; I admit that it even convinced me to give out my e-mail address to a Facebook app! What is great about these progress bars is that they usually suggest the next step you should take to increase the completeness. “Want more? Add this box to your profile!” It’s simple, easy to follow, and you get something new to do each time. It’s also common to show some kind of progress bars in learning activities such as online lessons. You’ve probably seen this too: “You’ve completed 80% of this lesson”. Unfortunately, these progress indicators are often way too impersonal too provide anything else than plain information. And this can be quite boring. You know in advance that all you have to do is keep clicking the Next button and you’ll eventually get to the end. Now, what if we would try to integrate the interesting type of progress bars in e-learning courses? I’m thinking about some sort of course-wide (and even site-wide) progress indicators. Let me explain what I mean. You have an online course, and you’re using a LMS; let’s say Moodle (the LMS I’m most familiar with). And you have a set of activities students have to complete. Your LMS allows you to group these activities by weeks or topics. Now you also have a tool that allows you to set the connections between activities. For example, a student should first read the introductory article, then discuss it on the forums, and at the end of the week write a blog post about the subject or make a podcast about it. And let’s also say that you could define a set of activities that have to be completed to unlock the next section. After clicking the link, our student, Lucy, gets a list of activities that she hasn’t completed yet or that she can improve. It’s not necessary to show all activities; the LMS only shows activities that make sense for Lucy at that time. Just a few of activities that Lucy can do next. If we want to get really smart, we could even suggest activities that best suit Lucy’s learning style. Let’s say we know that Lucy likes doing podcasts, but hates writing. In this case, the LMS would just suggest Lucy to do a podcast, and leave the option of blogging out (Lucy could of course change her preferences at any time and choose from a full set of activities). 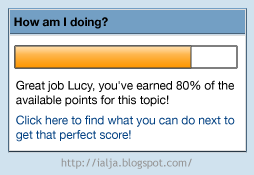 At any time in the course, Lucy can also get the info about how successful she was in previous weeks/topics and have a look at the course overall progress bar. To make things more interesting for Lucy, we focus on the overall course goal, and reward her each time she completes one with activity with another activity that bring her closer to achieving the overall goal. Lucy is also getting curious about what kind of activities she’ll get to do after she completes the current section. She knows her teacher always find interesting things to read and do. And you know what? I also think Lucy has been a good student so far, so she certainly deserves a special reward each time she completes a section of activities. We can display another star next to her name, and this week she also made it on our list of top students! Hurray Lucy! You’re so close to becoming the master of the course and save the princess! Ah yes, these are all well known game mechanics, but we’re currently not doing a very good job at implementing them in education, so why don’t we try do engage Lucy by giving her a clear sense of achievement in each course she’s taking? And if Lucy is doing really well, we might even give her the option to tell her Facebook friends about how good she is by allowing her to export some of this info into her Facebook stream. The same principle could also be implemented site-wide. For example, upon login in her school’s LMS, Lucy can see how much of the activities she completed in the current semester/year/program and receive suggestions on what activities she should do next - across different courses. If we want to get really, really smart, we can let Lucy tell us how much time she has available and suggest an activity that she can do in that amount of time or let’s try to guess which subject would most suit Lucy on a Monday morning! And again, we can also take into account her learning style preferences or even what we know about her past behaviors. Showing students exactly where they are and what their next steps can/should be is very important. And I think that progress bars and smart suggestions could provide an interesting motivational tool and a powerful way to help students organize their study and follow the progress of their study or a course. Now, I’ve seen a lot of individual online activities that provide some sort of progress bar and feedback (for instance, the Moodle Lesson module), but I haven’t yet come across any LMS that would provide this for the entire course or site and that would allow teachers to easily and precisely define the flow of different types of course activities. And I also haven’t seen any smart suggestion systems for learning activities. Am I missing something or is this something that hasn’t been done yet? Is anyone up to the challenge of implementing the described game mechanics into our courses? Let me know!